18th September, 2017 – The Australian-Thailand Chamber of Commerce (AustCham Thailand) launched the 2017 ASEAN Business Survey at the Australian Embassy Bangkok on 14 September 2017. The event featured a presentation of the business survey results by AustCham Thailand’s President, Mr. Brenton Mauriello; followed by a panel discussion with the Australian Ambassador to ASEAN, Ms. Jane Duke, CFO & VP Business Development of NS BlueScope Thailand, Myanmar & Laos, Mr. Sam McMahon, and CEO of PKF Thailand, Mr. Andrew McBean. With an audience of about 100 prominent representatives from the Australian-Thai business community, Mr. Mauriello presented the findings of the survey, highlighting key points affecting the region and the impact on businesses in Thailand. He provided a positive outlook for ASEAN, with more than 60% of companies recording more profitable earnings in 2016. However, respondents raised continued concerns on factors restricting business growth, such as political stability, government bureaucracy and corruption. When looking at Thailand, the main challenge for businesses continues to be access to skilled labour, with a lack of vocational skills training attributed to the shortfall. Mr. McMahon told the audience that Bluescope had created its own training academies with the assistance of NSW TAFE in an effort to bridge the gap. “With the assistance of the Australian Embassy, we were able to bring up NSW TAFE to assist with implementation and train-the-trainer programs, and we now run 20 academies throughout Thailand.” Mr. McMahon said. He stressed that it required a lot of effort, but the rewards were worth it, and encouraged other Australian companies to look at similar initiatives. Further insights from the panel discussion revealed the need for Australian businesses to better understand the investment opportunities available in ASEAN. Mr. McBean explained that trade with countries like New Zealand makes sense from a distance, cultural and governance perspective but ASEAN should be an additive strategy. “The GDP of NZ is around $185bn however the economies of the largest 5 ASEAN countries all have higher GDPs than New Zealand, including one which is 5 times that and, here in Thailand, more than double that. Together those 5 have GDP’s totalling $2.2tn. All are growing fast and, through to 2030, will double their consumer class from 81m to 163m. There is very significant opportunity in ASEAN for Australian businesses who are at least geographically closer than European or US companies” Mr. Mc Bean said. On a positive note, the presence of the ASEAN Ambassador mission, which was initiated in Jakarta, Indonesia in 2013, reinforces the importance of ASEAN to Australia’s strategic and economic interests. “As a bloc, ASEAN is currently Australia’s third largest trading partner (after China and the European Union) accounting for almost 14% of Australia’s total trade. In 2016, two-way trade totalled A$93 billion while two-way investment reached A$224 billion.” Ms. Duke said. She further explained that the Australian government were excited about the ASEAN-Australia Special Summit, which will be hosted by Prime Minister Malcolm Turnbull in Sydney in March next year. “The Summit is an unprecedented opportunity to reinforce Australia’s commitment to strengthening our partnership with ASEAN and generate fresh momentum. We want it to deliver practical outcomes that will advance our shared interests in peace and security and economic prosperity.” she said. 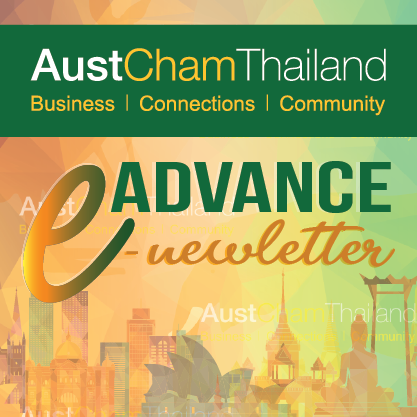 The Australian-Thai Chamber of Commerce (AustCham Thailand) was the first Australian Chamber to be formed in the ASEAN region The Chamber acts as a contact and information point for Australian businesses in Thailand, Australian businesses wishing to trade with or invest in Thailand and similarly for Thai enterprises interested in doing business with or in Australia. AustCham Thailand aims to provide quality and constructive input into the formulation of policies impacting on business (both by the Thai and Australian Governments), and their administration, and to contribute to the development of relations between the two countries.